A large business printer, which can handle large workloads, the Samsung SCX-5835NX has a print-cycle of over 5,000 prints a month. 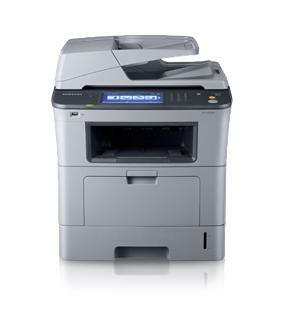 You can print, copy, scan and fax using this multi-function laser printer. There are also a number of functions to suit large business, including security software, and an 80gb hard drive - allowing the printer to manage large volumes of jobs at one time. The Samsung SCX-5835NX is freestanding device which comes in a stylish black finish that would suit the most modern of offices. The printer features a double tray design, with a 500 sheet A4 paper tray and a 500 sheet multi-purpose tray. The rear of printer houses the power connection socket as well as the high-speed Ethernet port. The 18 cm LCD touchscreen on the Samsung SCX-5835NX allows for easy navigation of printer functions, and jobs, while the huge hard-drive helps make printer maintenance a lot easier – great when getting rid of those annoying paper jams. Print speed is fast at 33ppm, and capacity is ample. Unfortunately, connectivity is basic – it would be nice to see the option to connect wirelessly. Only printing in mono may also be an issue especially if you run a small business and need to print promotional/marketing materials as well as standard business documents. Print quality is also dubious, with signs of banding and fading on large text documents.